It’s tough to stand out amongst the plethora of isometric action-rpgs, but Torchlight has managed to do so since the first installment. Now with Torchlight Frontiers, Echtra Games wants to bring a shared world and MMORPG-like features to the series. You might hear “shared world” or “MMORPG-like” and start to worry but there’s no need for concern, Torchlight Frontiers is still very much a Torchlight game. At Past West 2018 I got a chance to play the game for myself and came away from it really impressed. The shared world aspect of Torchlight Frontiers is something I was initially worried over, but after seeing how it works that’s no longer the case. Much like Destiny, areas of the world will be shared between several players once you leave town and enter a combat area. If you leave the combat area, you will no longer be sharing a zone with those players, but if you group up with another player the two of you will continue sharing zones and instances with one another. It makes grouping with others easier than before, pushing the co-op element of Torchlight central to the experience. Fans might be disappointed that there is no single player component, however, you can you can, of course, solo your way through all the content without the need for others. For my playthrough, I played as the Dusk Mage class, a wizard that balances light and dark magic attacks through meter management. Once you use up enough dark or light attacks and max their respective meter, you can add a passive buff when you switch to the other form of magic. It felt fantastic blasting foes up close with dark attacks, then spiriting away and kiting enemies with light attacks from afar. The pace of combat keeps you moving with very little downtime between engagements. Despite that they’re calling it an MMORPG, the combat feels exactly like the past Torchlight games. The past Torchlight games were all about loot drops and getting better gear for your adventures. Now that aspect of the series is pushed even further as traditional character levels are completely nonexistent. It’s a puzzling change on paper but considering progression in these games is driven by gear acquisition, I think it’ll work out. Items themselves have levels, unique modifiers, and customization that should make up for the lack of character levels. Crafting is something new to Torchlight Frontiers and is one of the more MMORPG-like staples to be found in the demo. Torchlight 2 had a transmuting system that allowed items to be combined, but the crafting in Torchlight Frontiers is more heavily involved than that. There’s even gathering nodes out in the world you’ll need to harvest for materials. The crafting system itself was not in the demo for me to try, but I was assured by a developer from Echtra Games that it will be a big part of improving and leveling weapons. 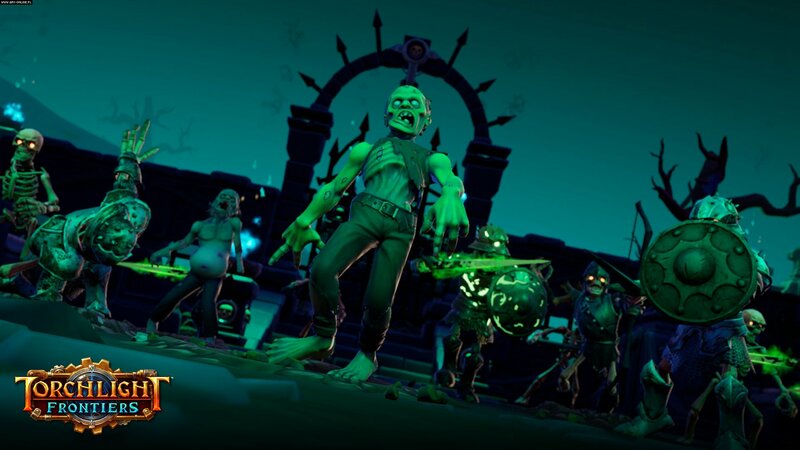 Burnout in MMORPGs is common partly due to repetitive dungeon structure but Torchlight Frontiers looks to remedy this through procedurally generated zones. When I heard this game was going to be more MMO-like I assumed they would do away with the procedural generation from the past games but thankfully it’s still here. It may not seem like much but the randomized nature of Torchlight’s zones should help tremendously with the burnout factor of MMORPGs. If you were at all worried that Torchlight Frontiers was not going to be a real Torchlight game you can now rest easy. After playing the demo myself, not only can I confirm it’s a real Torchlight game, but I think it has the potential to be one of the best action RPGs out there. It’s trickling with smart ideas that are distinctly ‘Torchlight’ making it one of the most exciting MMO-like projects in years. I for one can’t wait to get my hands on the final product when it launches in 2019.